Grab bars are one of the quickest and easiest security options to add into your bathing area. Whether looking for an easier and safer way to get into your tub or shower or to move about the bathroom, grab bars can help minimize accidental falls. Helpful both for the individual to maintain balance and for anyone assisting the individual to distribute weight during transfers. Hence, grab bars are not just for use in the shower or bathtub. You can also place them near the toilet and anywhere else throughout the bathroom where extra support is beneficial for the individual to move safely. We offer several ADA compliant grab bars. Each grab bar is commercial grade, 1-1/2″ Diameter, 304 Grade Stainless Steel, 18 Gauge Material with a 500 lb capacity. Even though they are industry grade, they do not have to look it. Rather they are available in several finish and size combinations to meet any need. 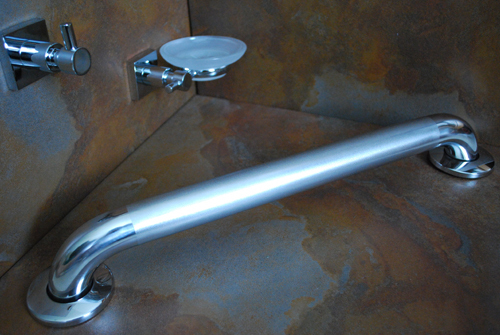 Featured here is a sample of our polished and engraved grab bar. While polished on the ends, the engraved portion has a slight texture which enables a better grip and provides extra slip resistance. Install grab bars either vertical, horizontal or on an angle to a variety of surfaces. Vertical installations can provide support for standing. Horizontal bars can be useful for either rising or lowering into a position or to grab in the event of a fall. While angled installations may be most beneficial in areas where assistance is need to rise from a seat. Combine any of these options with our compatible bathroom safety options. Be sure to properly install and secure all grab bars. Hardware provided with our products is for drywall mounting and should be fixed to studs to provide the best support. Place an order online or contact us with any questions.